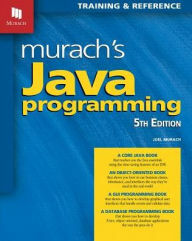 Murach's Java programming is for anyone who wants to learn all of the core features of the Java programming language. The book is for those with some programming experience or those with no programming experience at all. The book teaches you how to develop java applications efficiently like in the real world with the help of an IDE. Complete real world applications are presented, including a complete product manager application that uses many of the core Java features, such as classes, business classes, and database classes to implement the three-tier architechture. The end of chapter excercises will allow you to test your skills on what you learned after each chapter. Also, Murach's paired-page format with explanations on the left page and syntax of the right will help you learn quickly and also allows the book to serve as a valuable reference.